Hello friends, in last part I talked about 11 high-altitude trans Himalayan lakes and today I am here again with rest of the 19 lakes. It took too long to wrote and collect all the information. I know there will be lots of spelling and grammatical errors but still happy to share with you friends. Here is my love for Himalayas. Enjoy the article. It was August 2015, perfect time to trek in Himalayas. I was with friend Naveen who also lives in Himachal Pradesh. He has been saying me “Bro lets go on a long trek” since long long time and I was planning a beautiful route to enjoy with Himalaya. It was a 18 days long trek in which we covered almost 280 kms trek on foot, In that we covered 6 High altitude lakes and 5 mountain passes. It was second day and we were on our first destination which is “Gauri Kund”. Gauri kund is situated in Chamba district of Himachal Pradesh, India. This lake is very importance for women. This is the place where Mata Parvati had done penance to get Lord Shiva. Only women are allowed to go and bath at this place during Manimahesh Yatra. Many pilgrims who go to the bath in Manimahesh take the Ganges water with them. During his visit, Gaurikund's water used to bounce. The holy lake situated on 4000 meters from sea level. Hindu tourist devout comes every year to visit the Holy Lakes during the monsoon. Hemkund Sahib known as Gurudwara of Shri Hemkund Sahib Ji. The place belongs to Sikh community for worship. Hemkund sahib is situated at an elevation of 4632 meters from sea level at Chamoli district, Uttarakhand, North India. Gurudwara and the lake is devoted to Guru Govind Singh (1666 to 1708), the tenth Sikh Guru. The lake is setting of a glacial lake surrounded by seven mountain peaks. According to the Survey of India (SOI) located in the Himalayas at an elevation of 4632 meters. It was June 2015, route was just cleared by Gurudwara community. I was with my other friend Monu. It was second day after getting off by bus after 20 hours long journey. Trek starts from Govindghat on the Rishikesh-Mana highway. Hemkund is a Sanskrit name comes from Hem (Snow) and Kund (Bowl). Dasam Granth (10th book - A Holy Religion book from Sikh community) says this is the place where Pandu Raja practiced Yoga. Sikh pilgrims arrive in May and set to work to repair the damage to the path over the winter, which tradition is called kar seva (selfless service). The starting place Govindghat is about 275 kms from Rishikesh. It is a total 9 Kms trek to Ghangaria which is also called Govinddham. Pilgrims can cover the distance by foot or by pony. On such altitude one can easily sick from AMS hence no one can stay on night, everyone has to move to Ghangharia. It was October 2015 and I have already been covered Manali-Baralachla highway with my three other friends. We were in car and now they have to leave to join office. I dropped at Mandi bus stand from there I took a bus to Rewalsar lake. It’s a mid-altitude lake situated on a mountain in the Mandi district which is almost 23 km from Mandi main town, Himachal Pradesh, India. It is situated on 1360 meter above sea level. Rewalsar’s shaped is like a square with shoreline of almost 735 meters. It is a sacred place for Hindus, Sikhs and Buddhists. There are three Buddhist monasteries around the lake. It has also three Hindu temples dedicated to Lord Krishna, Lord Shiva and to the Sage Lomas. There are another a sacred lake exists, Kunt Bhyog which is situated on 1750 meters from sea level and lies just above Rewalsar lake. As per the history that the 'Tantric Teacher' Padmasambhava left for Tibet. Known to the Buddhists as 'Guru Rinpoche'. There are few islands are floating reed on Rewalsar lake and the spirit of Padmasambhava is said to reside in these floating islands. The Sage Lomas did penance in devotion to Lord Shiva here, and the Sikh guru Gobind Singh (Between 22 Dec 1666 to 7 Oct 1708), the tenth Guru of Sikhism, also resided here for one month and spend some quality time around the Rewalsar lake. Juda Ka Talab is a mid-altitude lake that trekkers come across Kedarkantha trek in the Uttarkashi district of Uttrakhand, North India. The lake is located in Govind Wildlife Sanctuary. Juda ka Talab means naturally formed lake. It was in May 2015 when I was just back from Advance Mountaineering Course (AMC) with “Alpha” grade. To test my stamina and skills, I went on Kedarkantha trek with my friend Monu. Lake is situated on 2700 meters from sea level, is a meadow site that offers scenic Himalayan landscapes. The lake site is used by Himalayan Shepherds to keep their animals, along with it also used as a camping ground for trekkers attempts Kedarkantha summit (3800 meters) from here. We were fast so didn’t stop here, clicked some pictures and moved to summit. Somebody wisely said once, “Whenever you doubt the presence of god, take a trip to the Himalayas”. It is a picturesque lake in the Supin mountain range in Uttrakhand. Sankri village is a small village located at a distance of 4kms below the Juda ka Talab is the base of this trek. If trekker goes further, one will reach the Kedarkantha peak which offers panoramic view of snow covered peaks including the Banderpoonch peak, the Swargarohini , Kala nag, and Ranglana peak. As per me this trek is an easy trek, ideal for beginners. It was our fourth day towards our long trekking expedition which completes in 18 days after 280 kms trekking on foot in wild Himalayas. Last night we stayed at Manimahesh lake and now after having breakfast me and my friend were going towards Kamal kund. Kamal Kund lies in the base of Manimahesh kailash, it is situated at 4 kms from the Manimahesh lake. The Holy Manimahesh lake is 27 kms from Bharmour by foot. The lake is under Chamba district of Himachal Pradesh, North India. In past history Few of devotees have seen floating flowers of Lotus in the Kund that’s by this Kund is called as Kamal Kund. Lord Shiva is believed to reside on this snow-covered mountain. It is one of five Kailasa’s, written in Hindu Vedas. The lake and peak are considered sacred and a fair called as Manimahesh Yatra is held at the lake each and every year in the month of August and September; the Yatra held from Janamastami to Radhastami each and every year. It is said that on this time period both Lord Shiva and Goddess Parvati gets the bath in the Holy Lake. To attend this holy moment lacks of peoples comes from across the country. A roofless temple, conspicuous with many iron trinkets, is seen on the opposite side. This lake also has the title of mysterious lake like Uttarakhand's famous lake Roopkund. On the 14th and the 15th of June 2018, according to local time, 'a date' and 'saja' in the Himachali language, in these two days of summer, Deity Kamrunag appeared to the whole world. Because Kamrunag is the biggest God of the valley and fulfills every vowel, so their fame spreads far and wide. Rohnada village is about 60 km away from Mandi city of Himachal Pradesh, North India. Kamrunag lake is about 5 km far from here. Rohanda is the place from the steep hiking begins. There is a lake in front of the temple of God, which is known as 'Kamunag lake'. The fair here attracts a lot of devotees every year and according to old beliefs, devotees put gold and silver jewelry and money in the lake. Based on this tradition, it is believed that the treasures of the billions have been suppressed in the bottom of this lake. Deity Kamununaga is considered to be the God of rain. According to one belief, there is ancient recognition of gold and silver and money for Lord Kamrunaga. It is also believed that "every veneration is accomplished by not giving any silver ornaments to any of your body in this lake". The lake is full of money, these gold and silver never extracted from the lake. "It is also believed that this lake goes straight to the hidden treasure of deities”. It was end of monsoon in Himalaya of year 2016. I was on a long trek with my friend. This time we planned to cover most famous valley of Himalayas “The Pin Parvati Pass”. While crossing the valley we visited Mantalai Lake, which is located at 4203 meters just before two camps towards Pin Parvati Pass. It was afternoon two and we reached at lake after struggle with heavy rain. Mantalai lake is the source of Parvati river. The lake is formed by the melting of snow from the nearby Parvati glaciers. There is a legend associated with a stone crossing at Mantalai and a shrine lined with tridents has been built to this effect. It was third day and we had already been crossed Hot Spring of Kheerganga, the trail passes though magical fir and rhododendron forests to bring the trekker to the meadows dotted with sheep of shepherds at Tunda Bhuj. The trail to Mantalai is starts from Barshaini village (1980m), is a challenging trek in itself if one will be there in monsoon, involving a significant gain in altitude from the base. Trekking to pin Parvati pass (5349m) involves crossing over to the Pin Valley (Spiti). Nain Sarover means in Hindi, The Eye Lake. Nain means Eye and Sarover is Lake. It is believed this lake represents the spirit of Goddess Parvati therefore we call it Nain Sarover. Shrikhand Mahadev is one of the five kailas’s and exists as a very Holy place among Hindu’s. It was my second attempt to visit the Shrikhand and visited successfully. The trek take place every year in monsoon and now days it is so famous pilgrimage among Hindu devotees. It is a natural reservoir that offers spectacular views during winter. The source of water here is believed to be the tears of Goddess Parvati. People take a holy dip and carry the sacred water with them. I was alone with myself, it was raining for three days. First night I spent at Singhad which you can assume the base of this trek. Second spent at Bhim dwar and on third day I was standing in front of Nain Sarover. The lake is situated on almost 4200 meters above sea level in Kullu district of Himachal Pradesh, North India. The most attractive and famous lake among tourists of Kumaon, Uttarakhand. Nainital is a natural freshwater lake, situated in Nainital town, North India. It is situated on altitude of 1938 meters from sea level, the length of lake is 1432 meters, width is 457 meters, surface area is 12.5 acres and the depth are 27.3 meters, quite a deep. The city name is on the lake name too. Around the Nainital lake there are few more lakes like, Sattal lake, Bhimtal lake, and Naukuchiyatal lake. I have visited only Nainital lake but have plans in future to visit rest of the lakes in this area. If someone do the circuit of Nainital lake then he will realize that there is all religion temple around the lake. There are a Goddess Sheetla temple next to lake where every Hindu visit, there are a mosque next to lake, Sikh Gurudwara and church. The town represents the unity of all religion. Tourists have lots of things to do there like, they can boat, marketing, there is a stadium as well to enjoy the local team cricket/football matches. A fabulous place to visit with family. Nako is small village in Spiti valley of Himachal Pradesh, North India. The lake is situated on almost 3600 meters from sea level. Lake lies in the sensitive restricted zone along the border with Tibet. The lake is a high-altitude lake which comes under Pooh sub-division of Kinnaur district. Nako is a Buddhist village and near the lake there are many Buddhist monasteries. Several miles away from Nako, there is a village called Tashigang, around which there are several coves where it is believed that Guru Padmasambhava meditated. I was with other three friends in a low clearance car, visiting Spiti vally. We traveled through the valley and enjoyed the time on Buddhisht land. It was 2017 when finally, I was on Pangong lake. I was thinking so much about Pangong lake and after attending the Hell Ultra 480 kms I got few days to visit the Chumathang valley. It is quite viral among tourists, it is not only Indian tourist visit here but also foreign tourists also visit here. While standing next to Pangong it felt like you are on some other planet. It is a High Grassland Lake, is and endothermic lake in the Trans Himalayas. Lake is situated on 4350 meters. Pangong is 134 km long and extends from India to China. You won’t believe that the 60% of the length of the lake lies in China. It got frozen in winter time, few of my friends cycled there in peak winters where the temperature was -36 degrees. The maximum depth of lake is around 100 meters. Tourists need to get inner line permit to visit there, after getting permit from Leh administrative office tourist leaves from Leh and crosses Chang la (5353m). It was July, means peak monsoon season and I am up to another High altitude self-supported trek. Two days back I was on Shrikhand Mahadev (5140m) and now trekking to steepest trek among five kailash. I was alone and rain was not stopping. I was wet and target was so far from myself and my limit. Nature was looking me very weird. Parvati Kund (Kinnar Kailash) is situated in Reckong Peo district of Himachal Pradesh, North India. Kinner Kailash is a Holy place among Hindu’s and every year in monsoon they went there to visit the Kinnar Pillar which is believed to be Shiva’s resident. The altitude of Kinnar Kailash is 4850 meters and Parvati Kund are situated on 4550 meters. It was fully covered with clouds when I reached there. Nothing was visible, at least for me. The base of lake was completely frozen from inside. Successfully I visited the Holy Pillar and came back to base of trek which is Powari village, lies next to Satluj river. I had visited Shrine Amarnath back to back two years, first in 2014 and second in 2015. It was summers in rest of the India and I was feeling cold in June month. This time I am going to Amarnath from another route which starts from Pahalgam, Chandanbari. The Sheshnag lake lies on the way to Amarnath cave. It is an alpine high-altitude oligotrophic lake, 23 km from Pahalgam in Ananthnag district of Kashmir valley, North India. Sheshnag lake is 120 kms from Srinagar and almost 23 kms from Pahalgam. Lake is situated on 3590 meters with maximum length of 1.1 kms with 0.7 kms width. As per Hindu mythology “Sheshnag” means the King of Snakes and it is also believed that the lake was dug by Sheshnag himself and he lives in lake even today. Brown trout can be seen in the lake while the lake freezes during the winter time. Tourists can visit there between June-August. Without permission no devote can visit the lake. The permit required because of terrorist activities. I was January of 2017 and I was preparing myself for Chadar trek which was I trekked in Zanskar valley in peak winter. So, I was with my friend Naveen who also lives in Shimla with his family. Tani jubar lake is almost 70 kms from Shimla district in Himachal Pradesh, India, and 12 kms from Narkanda village. It is a small artificially fed oval-shaped water body, shallow mass of water that is more of a pond than a lake. We were enjoying the views around the lake and spend many hours there. Blue pine and spruce trees can be seen there around the path of lake. There is a Nag temple next to lake. Where the locals offer their prayers to the Nag Devta. Another gem from Himalayas lap. Love the place very much and the blue water of lake was super fascinating for me. It was June 2018 and I had already been visited Pangong lake and now I was on another dream place. The Tso Moriri lake is a high-altitude lake, situated on Changthang plateau in Leh-Ladakh region of Jammu & Kashmir in North India. 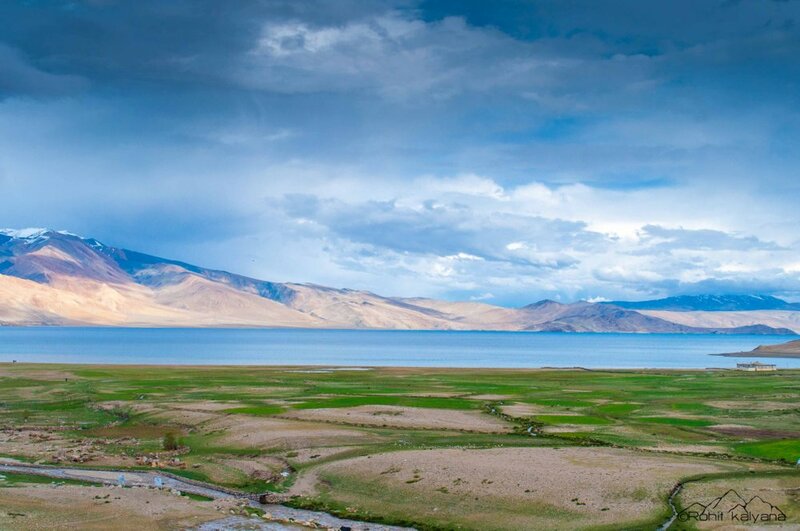 Lake and surrounding area are protected as the tso moriri wetland conservation reserve by survey of India team. The length of lake is 19 kms, width is 3 kms, surface area is 30,000 acres, depth is 105 meters and it is situated on the altitude on 4522 meters. Tourists needs to get inner line permit from Leh administrative office, and there are two ways to reach the lake one is via Chang la and second is from Pang. There are lots of lakes which does not contain any name, they just appear after melting the glacier. I do not have more information about them but still want to share with you guys. Unnamed lake, visited in 2017 winters with my friend while we were going to Hatu peak near to Shimla, Himachal Pradesh, North India. It was completely frozen due to low temperature. It was not looking like a big lake instead it felt like a frozen pond into the cedar tree forest. I was with my friend Naveen and we were trekking to Chandratal from Baralachla Pass. We had already been covered 230 kms on foot in Trans Himalayas and now we were ready to approach the Chandratal lake from this side. Just before Topko yogma we encountered an unnamed blue water lake. The altitude was 4823 meters and the lake were not that deep. The views from there were mesmerizing. Locals said that this is Nandi Lake which leads to Bada Bhangaal village. Just before the monsoons local villagers from Bada bhangaal trekked to Manimahesh kailash via Nikora Pass (4755m). It is a glacial lake and made in summers after melting the snow. Devotees take bath in that while doing circuit of Manimahesh kailash. It was semi-frozen while I was there. We didn’t take bath and moved ahead because it was a long way to cover that day. I was doing Advance Mountraining Course, and the entire batch was moving to advance base camp to learn Snow and Ice craft. While moving to Dzongri pass we saw a lake at Shokha. Do not remember the lake name but locals named it “Shokha lake”. It is situated on 3800 meters from sea level in North Sikkim on the India-Nepal border.